Jair Bolsonaro, a previously unknown figure in Brazilian politics, recently swept to a landslide victory in the country’s presidential elections. Taking 10.7 million votes from Fernando Haddad, representing the ruling Workers’ Party (PT), Bolsonaro’s policies are broadly right-wing with a strong liberal stance. His economic standing has a strong free-market element. Investors have celebrated his victory and the Brazilian stock market skyrocketed. Read on to discover why his election may mean good news for investors in Brazil. One of Brazil’s main underlying problems is the long overdue fiscal reform and an inefficient pension system. One of Bolsonaro’s big election promises was to undertake a major overhaul of the country’s finances and put it back on positive track. At the beginning of November, he announced talks with the President of Brazil’s Supreme Court, José Antonio Dias Toffili, to reach a wide-ranging pack for fiscal reform. The pact would involve the government, parliament and the judiciary system. It would also focus on reducing the fiscal deficit and pension reform. To help him carry out this reform, Bolsonaro looks set to appoint Paulo Guedes as the country’s Minister of Economics. Guedes, a free market economist with a degree from the University of Chicago, is viewed very positively by investors in Brazil. “I think the economic policy direction is going to be a good one,” said Christopher Garman, managing director for the Americas at Eurasia Group, quoted in Foreign Policy in early November. “The enthusiasm on that front is well grounded,” he added. 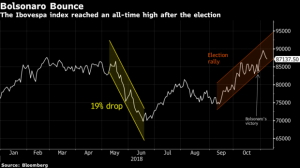 In the run-up to the presidential election when Bolsonaro was leading all the polls, the Brazilian stock exchange soared. Between 28 September and 29 October, it rose by 22%, prompting the “Bolsonaro Bounce”, as clearly shown in the Bloomberg graphic below. The stock market has since continued to boom. According to Bloomberg, investors added US$367 million to US funds that track Brazilian stocks and bonds in the first week of November. This is the largest flow since May 2017 and a sure sign that investors in Brazil remain bullish. Stocks later reached 89598.16 points on 16 November, their highest ever. Unlike Mexico, where markets fear the new government, “Brazil’s incoming president has triggered a huge rally in financial markets,” according to Bloomberg. Financial Post quotes Jorge Mariscal, emerging markets chief investment officer for USB Global Wealth Management. “Brazil is a tempting option,” he said, particularly for international investors who have made losses recently on the S&P 500 Index and the Dow Jones Industrial Average. Brazil’s advantages, according to Mariscal, include cheap equities, a “reasonably priced” currency and record-low interest rates. • HSBC Holdings Plc are in discussions about returning to local markets and creating a full corporate and investment bank. • Citigroup Inc is stepping up its US$176 billion in infrastructure investments over the next five years. • Itau Unibanco is considering relaxing credit restrictions on the back of an improved economic outlook. According to Marcelo Marangon, chief country officer for Citigroup in Brazil, Bolsonaro’s victory was “a call for change in the way the country’s led and we have huge expectations on the changes that need to get done,” he said to Bloomberg. He underlined the fact that “every international bank is analysing growth opportunities”. Bolsonaro does not formally become president until January 2019 and investors in Brazil will be following his first 100 days in office carefully. According to Brazilian analyst Kenneth Rapoza, writing in Forbes, they can expect the following push for lower taxes. Bolsonaro reportedly plans to reduce federal income taxes on a level recently seen in the US. His policy would include abolishing income tax for Brazilians earning less than four times the minimum wage and introduce a flat rate of 20% for everyone else. Investors in Brazil can also expect privatisations of some of Brazil’s largest public-owned companies. Bolsonaro has shown himself to be fully in favour of transferring public companies to private hands. Analysts expect the telecommunications sector to be one of the first. He will announce his budget in March, an event that will be in the world limelight. Investors and analysts will be examining this document carefully as it will include several key features. Among them, are how the new president plans to reduce the country’s fiscal deficit and tackle pension reform. Expectations are high that he will manage to bring about the long overdue reforms. As for other concerns, in his victory speech on 28 October, he said “I give you my word that this government will defend the constitution, democracy and liberty. Our government will be founded by people with the same proposition: to transform Brazil into a great, free and prosperous nation”.